Cutest Card in a Box Ever! We had our team event last Saturday. It was a great day spent with people who love craft as much as I do, and in particular Stampin Up! 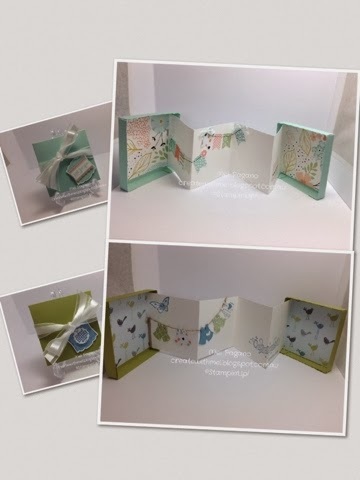 One of the make and takes was this cute little Card in a Box project. The top picture was the one we were taught using Sale a Bration Products. I definitely feel another class coming on! I think it will be great for my April 3D class, don’t you! Oops….I didn’t realise it’s been a week since I have been on here! Gee time flies when you are having fun! Life can be soooo very busy, so for me, craft is my sanity break! So, another use for the spiral flower die in the new Occasions Catalogue on Page 32. I initially wanted to use the flowers in a tea cup – perfect for Mother’s Day…then I remembered I had a template for a watering can….PERFECT! I used the new DSP out of the Sale a bration Catalogue called Sweet Sorbet, that you can choose for FREE with an order over $90 (not including P & H). Now I love this DSP, but I can’t lie…I really wasn’t sure what to do with the black pages! I have used it for a couple of things now, and must say I quite like it…but I thought….hmmmm, how would that look as a flower. I’m pretty impressed with the result, let me know what you think. 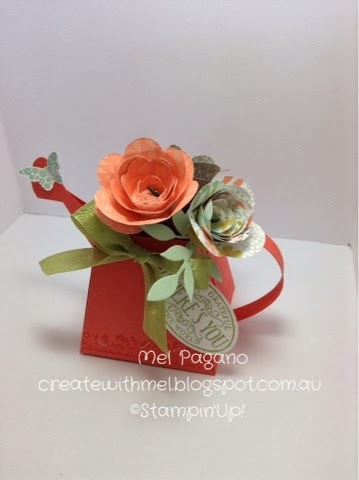 The template for the watering can was found at splitcoaststampers…an amazing crafty bunch! 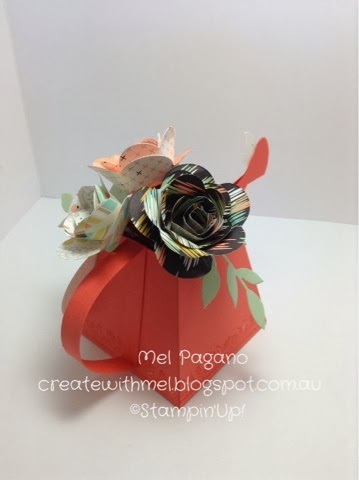 I love the Spiral flower Die that was released in the mini catalogue last month. I new as soon as I saw it that I HAD to have it. I have been creating a few projects with it in the lead up to my team day today, so now I can reveal them to you all. 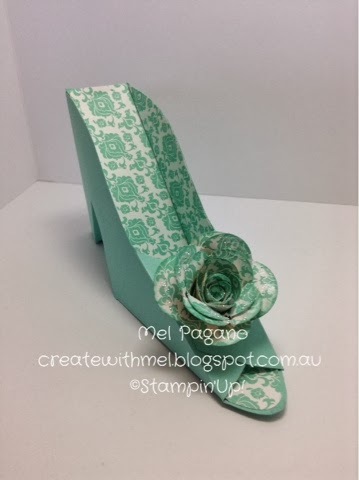 I will start with this gorgeous shoe that I have made that I found here. There is a downloadable template so you are able to make your own :-). It could be filled with a little bag of chocolates (as I have done in the past), or you could even use it to hold lipstick or nail polish or anything else you could think of! This one was created with the in colour – coastal cabana and a piece of DSP! Lokking forward to hearing from you!